Wishing you all a VERY HAPPY NEW YEAR ! A new year is here, and so am I with my first post of this new year. 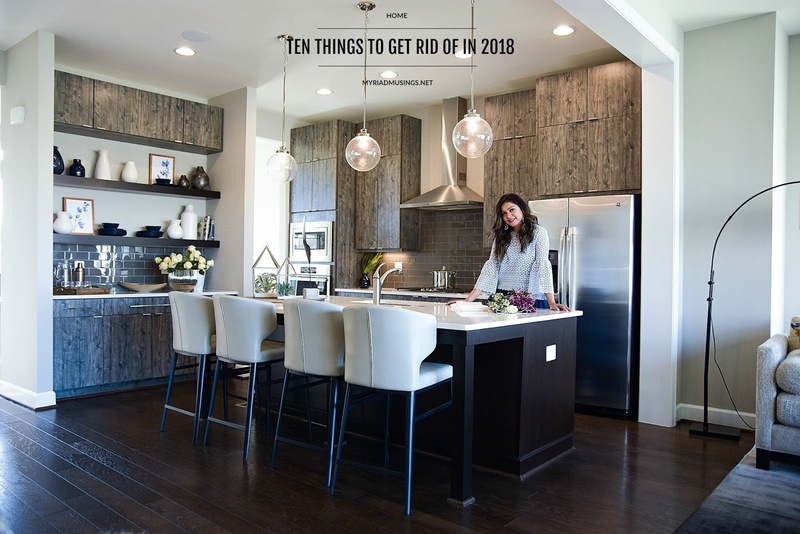 I am quite sure that your resolutions list is ready by now, and pretty sure that one of the to-do's on your list is "to organize and declutter your home and your closet. " If you are one like me, who is in desperate need of a cleaning intervention, then listen up. I am sharing the top ten unnecessary things you need to get rid of right away. There's some from your closet and some from around the house. 1) OLD CLOTHES - it's time you pay your final good respects to the old clothes, that you have been hanging on to, in anticipation of either that trend having a comeback or you reducing weight. The trend might return, but if you don't fit in them anymore, you'd better find them a new home. Not only is it using up space in your closet, but also fogging up your brain. 2) WORN OUT SHOES- shoes that are worn out, torn apart or have been sitting in your closet, waiting for their turn to see the mender, it's high time, toss them out. You are probably so sick of seeing them like this, that I can give you my words " you will never be taking them to the shoe-mender " ! 3) LINGERIE THAT IS RIPPED - if I am not mistaken, we all have a couple lace pieces in our lingerie drawer that is either pulled or slightly ripped. The first thing you are doing today is tossing those out, coz the day when you will have time to mend them is never coming, and even if you end up mending them by any chance, you will never wear them coz the the patch mended looks horrible. The same applies for tights. 4) FAUX LEATHER BAGS- I am guilty of owning a few forever 21 faux leather bags, that perhaps made their way to my closet owing to their trendy look, and that has already started to fall apart. Either the leather is starting to crack or the handle has fallen apart. It is time you adopt the mantra of " quality over quantity." Once you get a hang of good leather, high quality handbags, you will never go back to buying the cheap stuff. It might be an investment, but trust me " it is worth every hard-earned penny!" 5) OLD MAKEUP - every makeup item has an expiry date to it. It doesn't come announced, but there is definitely a time you have to pay them your final respects. As a general rule of thumb you should replace your mascara every three months, eyeliner and eye shadow every six to 12 months, and lipstick every one and a half years. Meanwhile, the average expiration date for foundation, powder, and other facial makeup is 12 months. So anything that has been sitting in your vanity for longer than their suggested replace time, you should toss them out. 6) OLD MAGAZINES, NEWSPAPERS AND BILLS- the entire world is going digital and so should you. Some of you might have a hard-copy withdrawal, but imagine the diminishing clutter around the house. 7) OLD RECEIPTS - did you know that ink on these receipts fade after some time ?? If you've had a paper receipt for a over six months, you will be left with a blank piece of paper, if you revisit the same after six months. So when the ink is meant to go away, the piece of paper is meant to go away too. Recommended way of saving store receipts, use this app. 9) EXPIRED PANTRY ITEMS- little did I realize that a ton of items in my pantry had expired, until my mom cleaned out the same for me. They were either hiding behind larger boxes or I was ignoring them, with hope of using it in my cooking one day. That one day never came, but the expiry day came and so did the burial day. So take some time and declutter your pantry and restock with fresh items as and when you need. 10) OLD CLEANING SUPPLIES- yes folks, cleaning supplies have an expiry date too. Not that they will explode past their expiration date, but why take a chance ??? So take heed and clean out all that has expired. Remember every county has it's own way of disposing cleaning liquids and chemicals, so make sure to visit the municipal's website before you actually toss em out. The above are the few things I'm saying bye to, what are the things you are getting rid of this year ?? ?